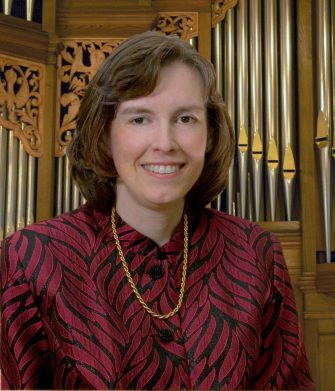 Dianne Maynard-Christensen serves as the Director of Music/Organist at Faith Lutheran Church in Rochester, New York, a position she has held since 1991. She oversees a large music ministry consisting of many vocal, handbell, and instrumental ensembles for all ages. She also coordinates the liturgies and special services/concerts throughout the year. Dianne serves on the musical faculty for three colleges. She is an Instructor of Sacred Music at the Eastman School of Music and Adjunct Professor of Organ both at Roberts Wesleyan College and at Nazareth College. Dianne has appeared around the United States and abroad as a recitalist and has been heard on the nationally syndicated radio program, Pipedreams. Recently, she led her choir on a tour of Israel, performing in front of a capacity crowd at the Basilica of the Annunciation in Nazareth, the largest Basilica in the Middle East. She has given lectures and master classes in organ literature, church music, and various worship related topics for colleges, churches, and professional organizations around the country. A past Dean for several chapters of the American Guild of Organists, including the Rochester, NY Chapter, Dianne is committed to providing educational opportunities for organists of all ages. She has served as an adjudicator for organ competitions on both the national and regional levels. She also has a special interest in bringing the pipe organ to young people and has served on the faculty of a number of Pipe Organ Encounters in various states. Dianne holds the Doctor of Music and the Master of Music degrees from the Eastman School of Music, where she studied with David Craighead, Russell Saunders, and David Higgs. Her Bachelor of Music degree in organ performance was earned under the tutelage of Larry Smith at Indiana University, where she was also awarded the prestigious Performer’s Certificate. Dianne has won prizes in a number of national organ competitions and is a member of several national honor societies.